I buy a lot of material for my research, and now and again sell material I no longer need. I maintain the German Propaganda Archive, a collection of English-language translations of propaganda material from the Nazi and East German eras. I buy a lot of material to translate, some of which I list for sale here when I am finished with it. I also buy stacks of things to fill in the gaps in my collection, leaving me with duplicates. Newer items are listed first. Postage costs are for the U.S. International postage will be higher. Conditions: I accept payment by check or through PayPal. My account is my e-mail address. I do my best to describe items accurately. If you buy something and feel that I have not done so, I shall refund your purchase price. I’ll adjust the postage should you find several items you’d like. Goebbels and National Socialist Propaganda: 1925-1945 (East Lansing: Michigan State University Press, 1965). Usually I offer only books from the Nazi period, but I have a second copy of this excellent, if early, book on Nazi propaganda. Bramsted lacked access to many sources that have since become available, but he did good work with what he had. The condition is good. Price: $20. Shipping: $3.00. Reichsarbeitsdienst Gau History: This is a remarkable volume — a hand-crafted history of the Nazi labor organization along the Rhine. It has to have been produced in a very limited edition. 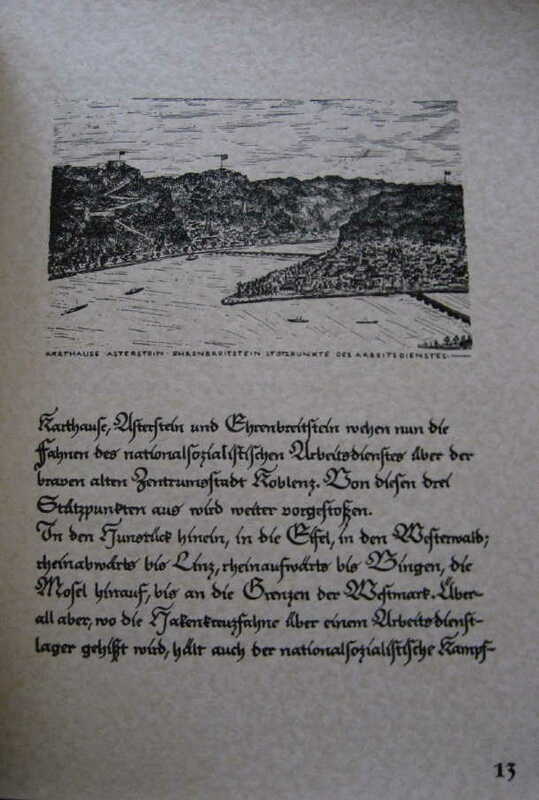 It consists of descriptions of labor activity in the various districts in typical Nazi verbiage, with typography ranging from type to elegant script, along with lots of illustrations, maps, and more. It was issued around 1935. This is an unusual book. It is in very good condition. Rare. Price: $250. Shipping: $6. Eugen Hadamovsky, Blitzmarsch nach Warschau. 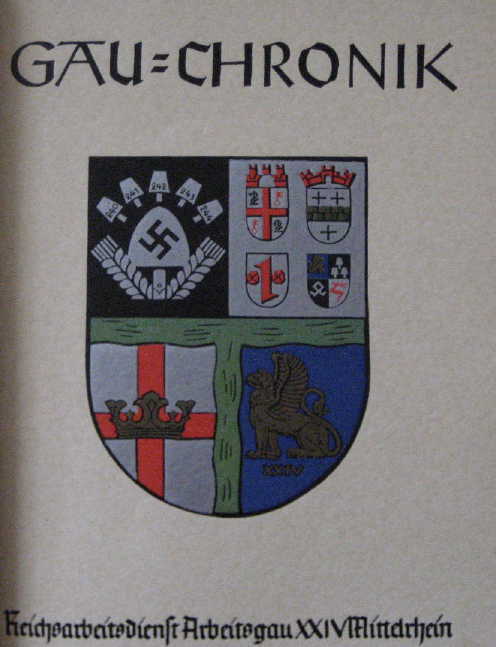 Frontberichte eines politischen Soldaten (Munich: Zentralverlag der NSDAP, 1940). Besides the book below, Hadamovsky wrote a number of other popular propaganda books. 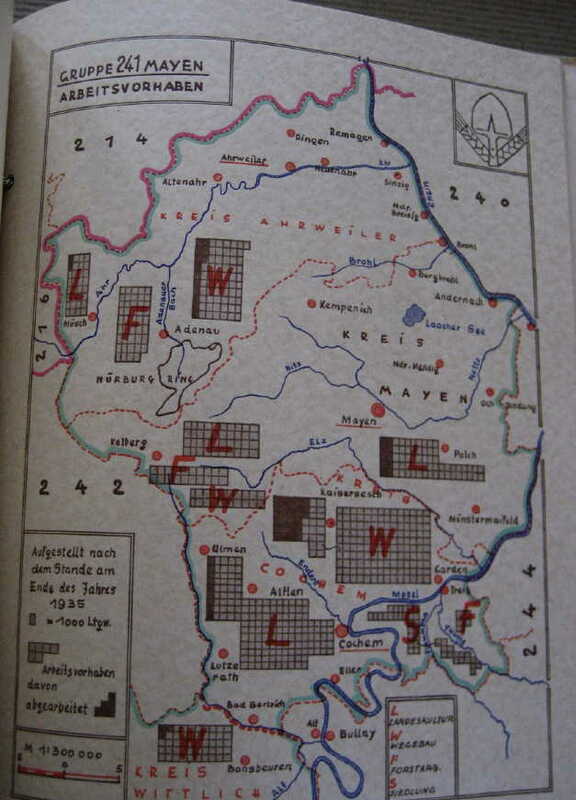 This one is an account of the events leading up to, and during, the Polish campaign. No illustrations, one map. The book is in good condition. Price: $18. Shipping: $3.50. 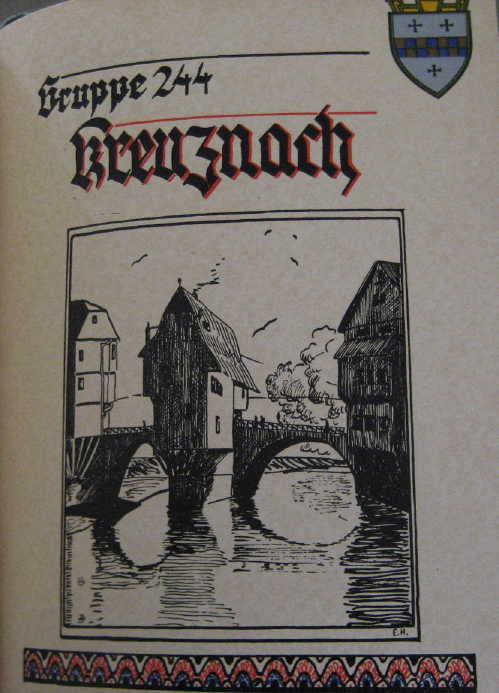 Kleine Kriegshefte: This was a series of eleven 32-page pamphlets issued during the first two years of the war. They contained war correspondent reports, and a lot of maps and photographs. I have copies of #3 ($22) and #9 ($21) for sale. Follow the link for details on content. Shipping: $2.00. A page on the red and blue books on the Nuremberg Rallies, published from 1933-1938. 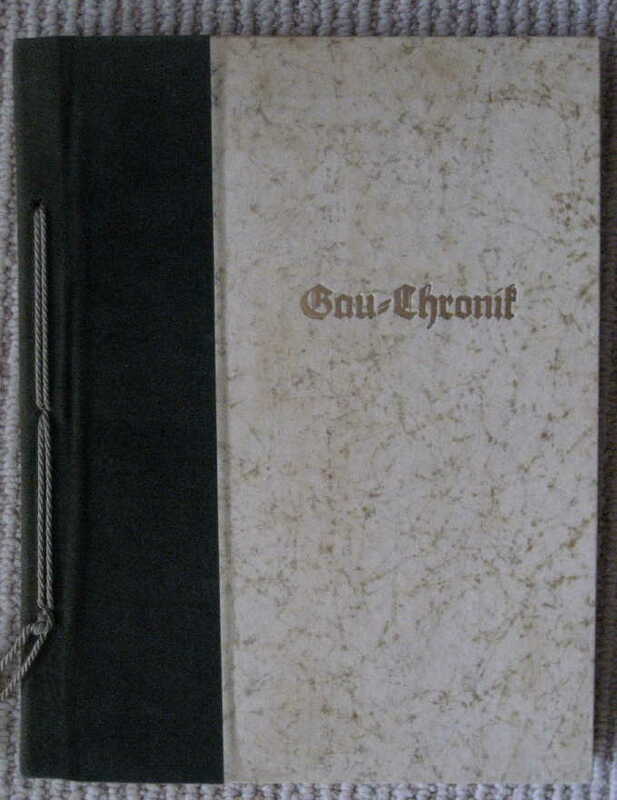 I currently do not have any copies for sale, but the page may be of use to those interested in the volumes. I have also written three books on the subject. My recent book titled Landmark Speeches of National Socialismincludes material not available on the GPA. Bending Spines: The Propagandas of Nazi Germany and the German Democratic Republic (Michigan State University Press, 2004) provides an analysis of much of the material on the German Propaganda Archive. It can be ordered in the United States through amazon.com in either the hardcover or paperback editions. My first book is on Julius Streicher, the leading Nazi anti-Semite. If you are interested in new books on the subject of German propaganda, I maintain a list of titles that can be ordered through amazon.com. I also have a list of more general books on Nazism that I’ve read and recommend.